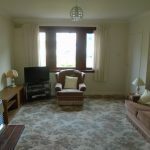 Lockerbie is a thriving market town which lies on both the national road and rail networks, making it ideally situated for access to the rest of the country. The surrounding countryside offers a varied choice for those seeking country pursuits such as fishing, walking and horse riding, whilst the town itself has an 18-hole golf course, bowling green, ice rink and squash court. 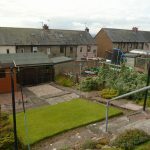 The town also offers the usual range of shopping facilities, whilst the county town of Dumfries (some twenty-five minutes away by road) has a Leisure Centre and a wide range of national chain stores and specialist shops. Carlisle is twenty minutes’ drive to the south. Lockerbie has highly-regarded schooling to both primary and secondary level in a new combined-school. 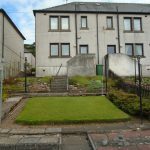 This two bedroom end of terrace sits in an elevated position overlooking the town of Lockerbie and is close to all amenities and services. 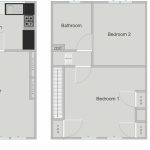 Although the house may be in need of modernisations it offers spacious rooms with excellent storage throughout and would be ideal for first time purchasers or as a rental property. 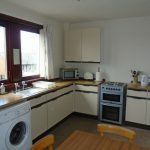 Dining-kitchen – This large room has a good mix of drawers, base and wall units including a tall larder unit with ample preparation worktops. 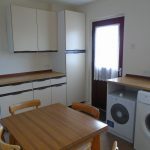 There is space for a slot-in electric cook which is included and space for fridge freezer, tumble dryer and space and plumbing for washing machine( the washing machine is also included). Stainless steel sink and side drainer. The room accommodates a table for family dining. The rear door to the garden is located here. 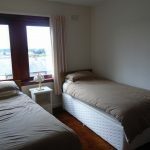 Bedroom 1 – A large double bedroom with two windows overlooking the front of the property. There are three built in cupboards offering a mixture of shelving and hanging space with one of the cupboards housing the water tank. 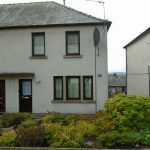 Bedroom 2 – A further double bedroom lies to the rear of the house and has two windows which offers elevated views of Lockerbie and the hills beyond. 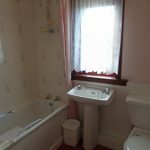 Bathroom – The bathroom suite, in white, is made up of a bath, w.c and pedestal sink with tiled splash back and partial tiling around the bath. A small mirrored cabinet is also included. 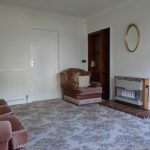 The property has Gas central heating and double glazing throughout. 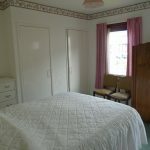 All blinds, curtains, poles and carpets are included in the sale. Outside – steps lead down from the rear door to the garden which slopes downwards and is reached by steps down with rockeries to either side. There is a drying green and further areas laid with stone chippings . 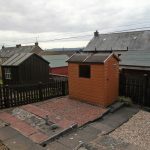 Also included is a wooden shed. A shared path leads to the front of the property. The garden at the front is easily maintained with a mix of mature shrubs.